Fall officially arrives on Thursday and the change in season is definitely in the air in my area of Virginia. We won’t have fall color for a few more weeks but the tree leaves are looking tired and one can tell that it won’t be long until the leaves change to their brilliant fall colors. In celebration of fall, I’m joining a group of friends for a week long fall tour. 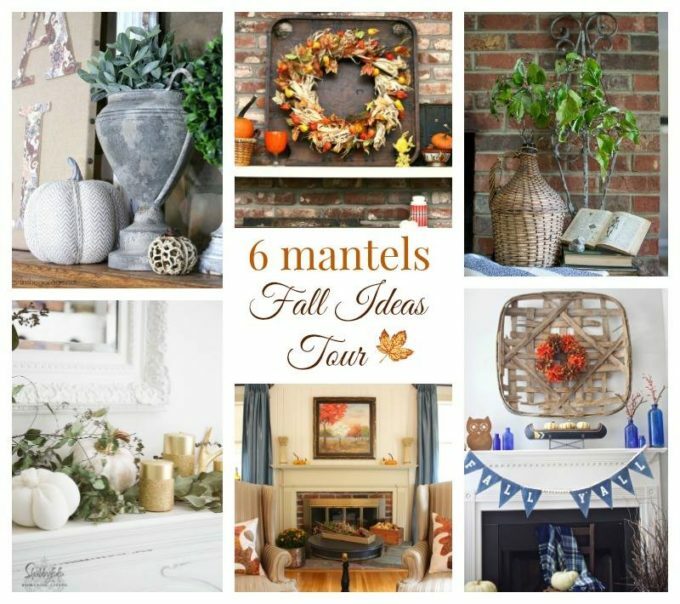 I’m excited to share my fall mantel along with five blogging friends who are also sharing their fall mantels today. 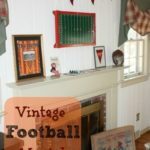 You’ll find the links to the other fall mantels at the end of this post along with the links for projects shared the rest of the week. 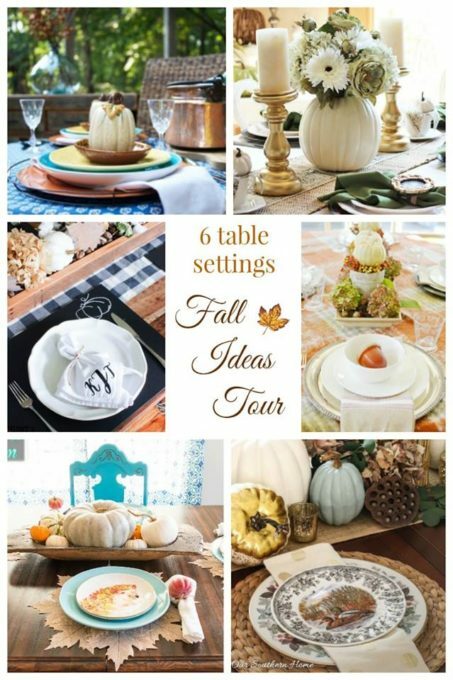 Be sure to come back each day to get tablescape, wreath, printable, and porch inspiration for fall. I enjoy decorating our mantel and living room for the season and it’s been a long while since I’ve taken the time to do so. In fact, I don’t think that I’ve decorated this room seasonally since Easter. 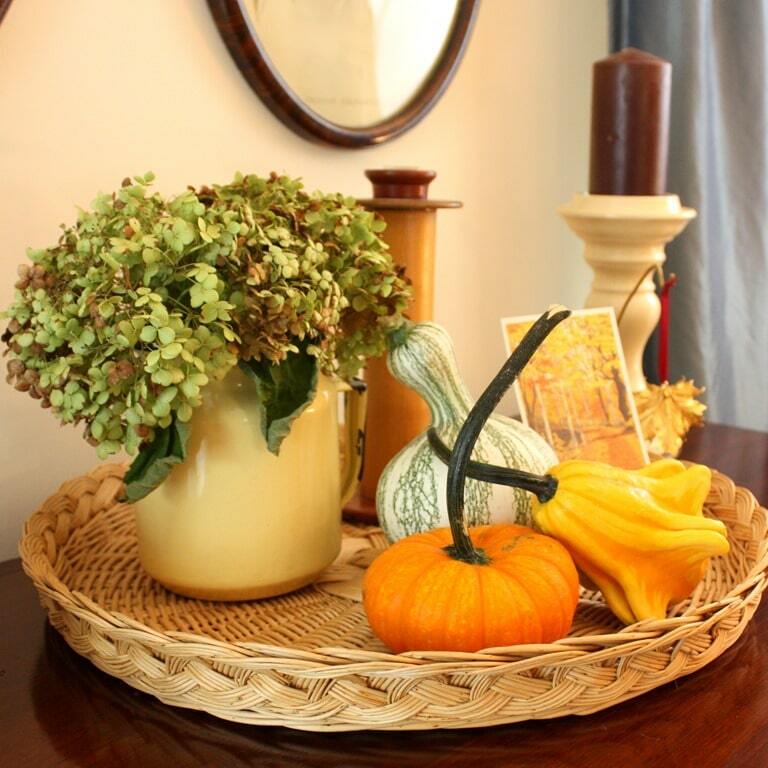 I so much enjoyed pulling out my fall décor and making this room look pretty. Even though we don’t sit in this room, I enjoy it daily as it’s the first room that is seen when entering our home. Truthfully, the family member who spends the most time in this room is our dog. Sherman spends his day sleeping on the love seat or in the floor in front of an air conditioning vent. 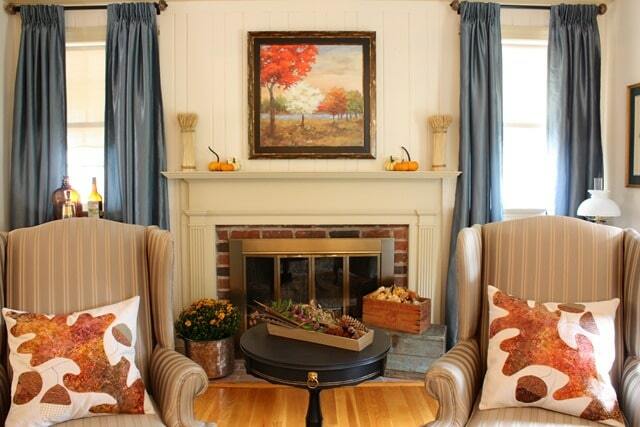 I found the fall scene at a yard sale in May and knew that it would be perfect to hang over my fireplace in fall. To complement the painting, I added wheat sheaves and small pumpkins. 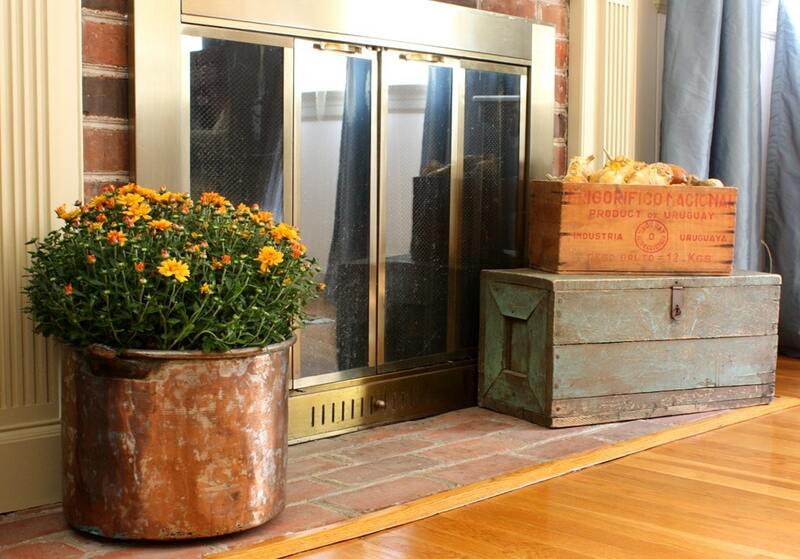 The hearth was the perfect place to display a fall mum in a faux copper pot along with a vintage toolbox and wooden box filled with dried gourds. I never throw out my gourds at the end of the season. After purchasing them, I follow these steps and when it’s time to decorate for Christmas, I spread my gourds out to dry in our basement. 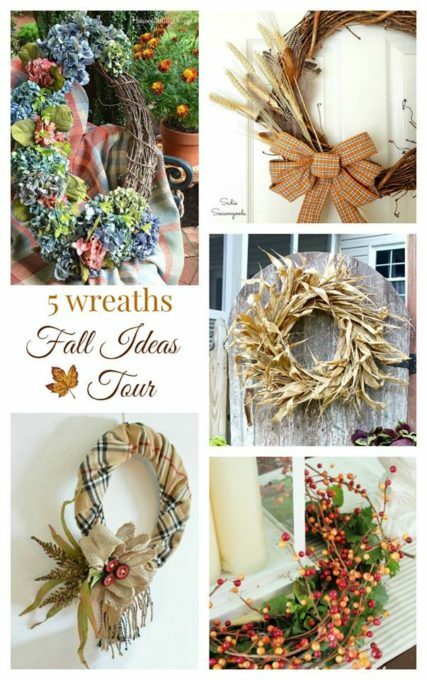 The next year I use this method to revive them for use year after year for décor. 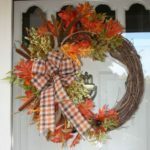 Fall décor is great because it can be enjoyed until late November when it’s time to decorate for Christmas. 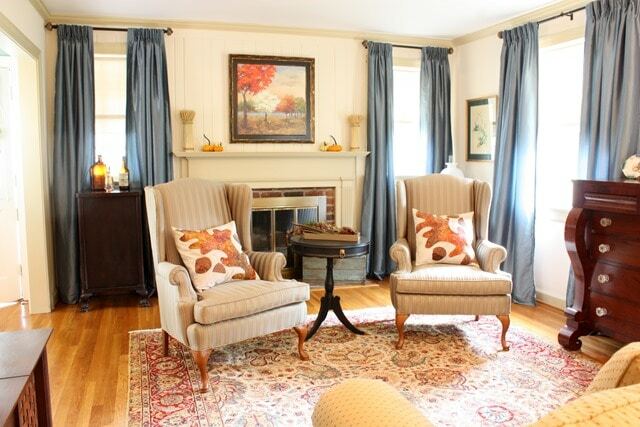 The table between the chairs (which I want to slipcover) was a DIY and so were the pillows. The music stand to the left of the fireplace holds a vintage Clorox bottle that my mom gave me, an old whiskey bottle that a neighbor put on the curb, and a decanter that my friend passed along to me when her mother had to move into assisted living. 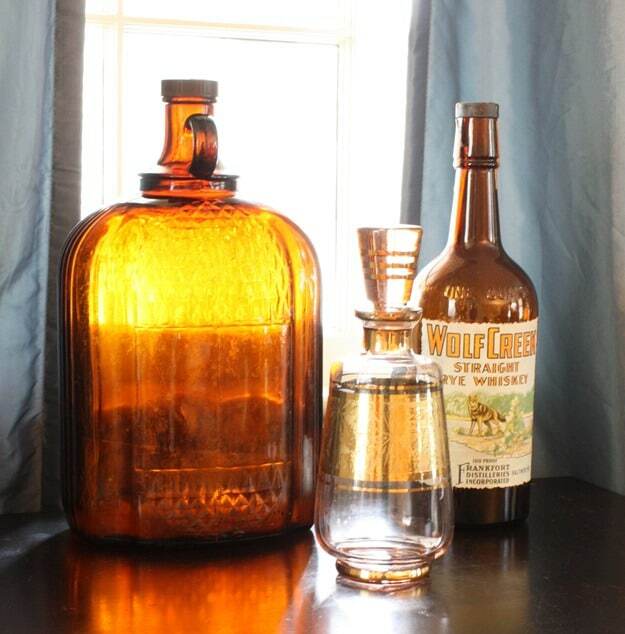 I love the way that the light shines through the bottles. 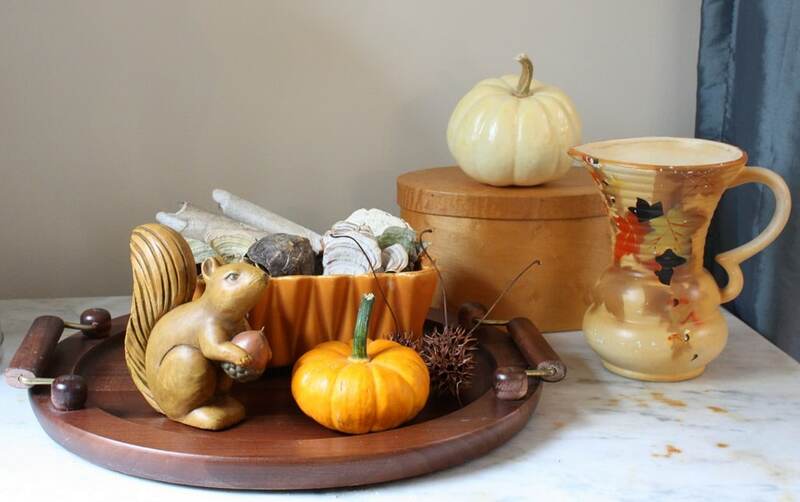 The table in front of the fire place holds a caddy from Goodwill that I painted and filled with fall items found in nature. The Beautyberry is from my yard and is tucked into a water pick hidden by the sweet gum balls and acorns. I’m hoping that this will last for a while. 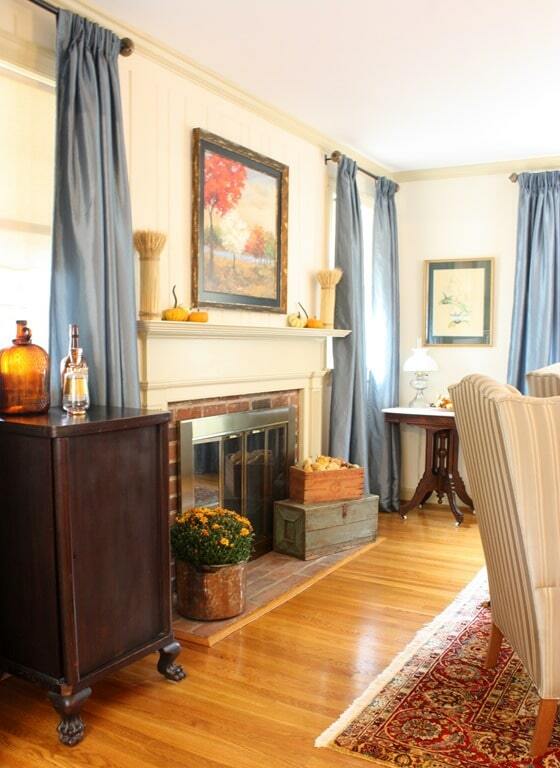 The chest in this room also is decked out for fall. The woven tray was found at a yard sale where I scored many mid-century treasures. The enamel pitcher belonged to my friend’s mom. My friend knew that I’d enjoy it and here it holds a few dried hydrangea from my yard. Mama gave me the wooden spindle and the candle holder was also hers, a gift long ago from my father. A Vermont postcard and a Vermont maple leaf preserved in gold complete the fall vignette. 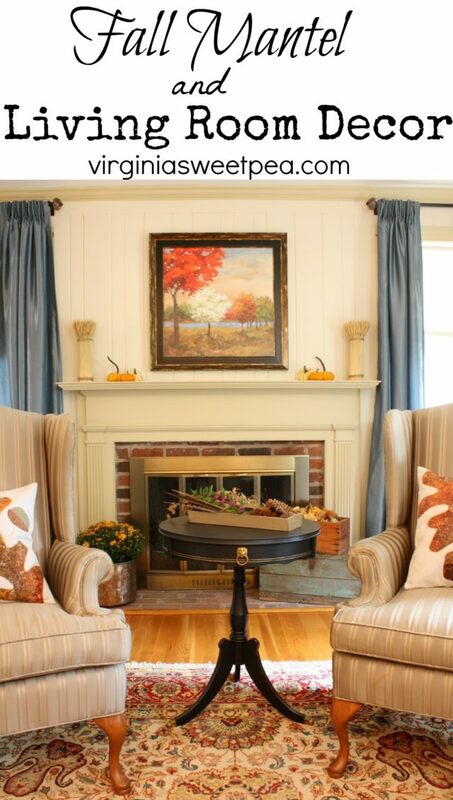 The table to the right of the fireplace gives me another spot to decorate for fall. The tray and pitcher were my grandmother’s. The pitcher is marked “Sophia – Made in England” but that’s all I know about it. 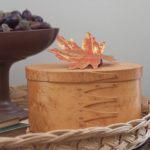 Mr. SP gave me the handmade Birds Eye Maple box very early in our marriage. All of the items displayed in this vintage planter were picked up in the woods last fall and winter on walks with my dog. I couldn’t resist adding the tiny turtle shell that I found. Would you believe that this white pumpkin is from LAST fall? Yes, last fall. My method of preserving gourds and small pumpkins works! I’m so excited to see what will be shared this week on the tour. 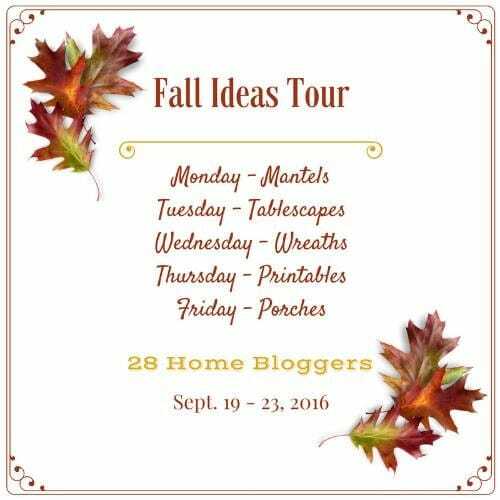 Be sure to visit the other ladies sharing their fall mantels by clicking on the links below. And be sure to come back each day to see the other projects shared. Paula – your home and mantel are beautiful. 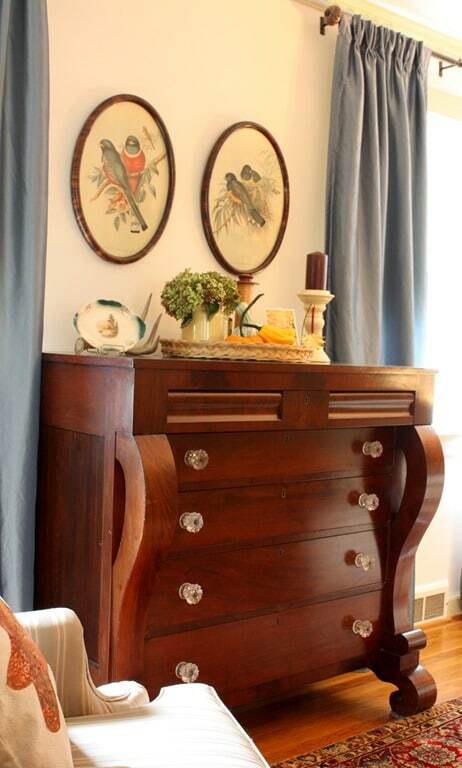 We love all of the vintage touches and sentimental pieces that you have decorated with. 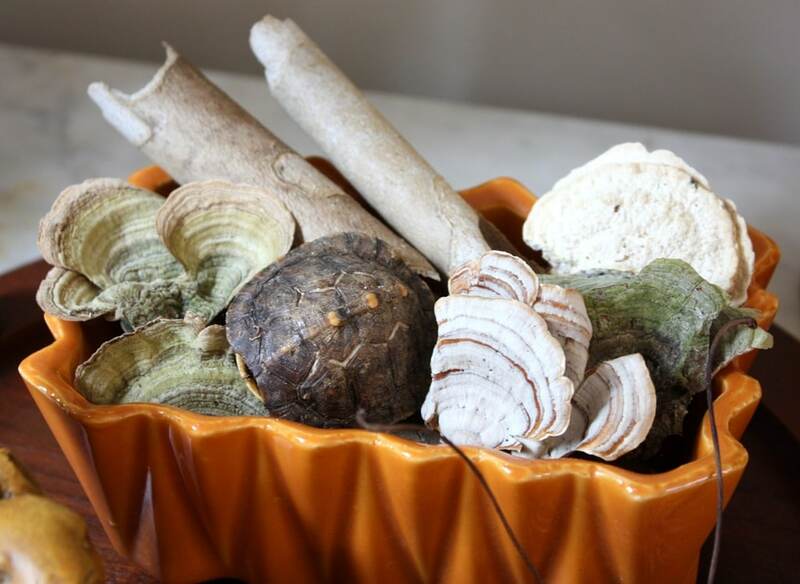 We will definitely be trying our your gourd drying method! Thanks so much for sharing! Thanks, ladies! I have fun using my vintage things each season. Paula, I want those pillows – so cute! Love all the sentimental touches you’ve incorporated into the room. I’m like you and keep my real gourds from year-to-year but will be checking out your drying tips to see if there is anything I may not be doing. I think I got lucky with the white pumpkin. I washed it and coated it in Future floor wax and kept it in the basement all winter, spring, and summer and I think that the dryness down there along with the waxy coating on the pumpkin helped to preserve it. I had some small orange pumpkins that just dehydrated into a little blog. It’s fun to experiment with them and if they can be used another year, I’m all for it! Thanks, Angie! We both love our vintage things! WOW! 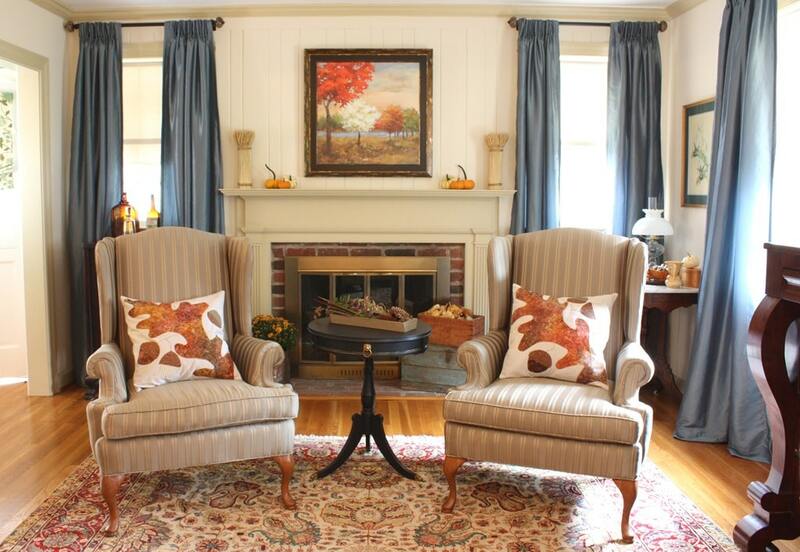 Your living room is totally ready for fall! The colors embrace this favorite season of mine perfectly! Thanks, Lindsay! I had fun decorating this space and plan to enjoy it until it’s time to change the decor out for Christmas. Thanks, Nancy! I love fall decor and now that this room is decorated, I have a few months to enjoy it. It’s all so pretty and festive, Paula! I love the fall artwork that you picked up secondhand- it’s perfect for the room. Thanks, Jen! I couldn’t pass that picture up for just $10. All summer it patiently waited in my basement to be used and now I’m really enjoying it. 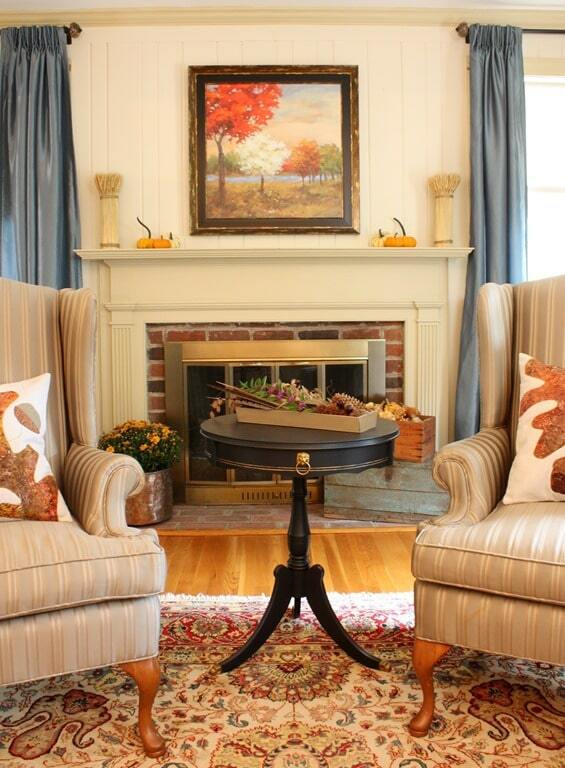 Paula…your Fall mantel is of such simplistic beauty…Love the painting…a great find. You have so successfully layered the fireplace area with such great color and texture using fabulous finds and antiques. I can always recognize your fireplace and that beautiful room of yours! THANK YOU, PAULA! 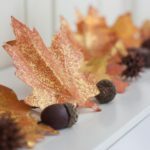 You’re not afraid of color – while the neutrals are pretty, sort of sophisticated, and very soothing – the colors of autumn are golds, reds, oranges, and browns! I appreciate seeing your rooms decorated like a tree – you’ve definitely brought the outside IN! Love it. Thank you so much, Barbara. 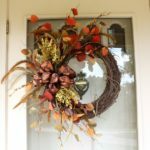 I definitely prefer decorating with traditional fall colors although I think that the neutrals that are popular right now are also pretty. 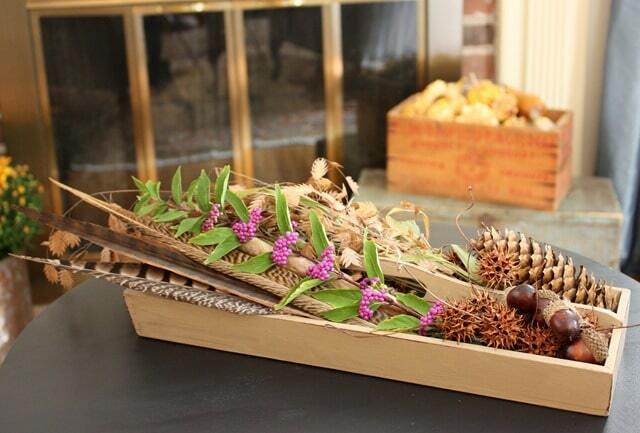 You made the perfect choice with that yard sale fall art! And those pillows!! Love them! Thanks, Jennifer! 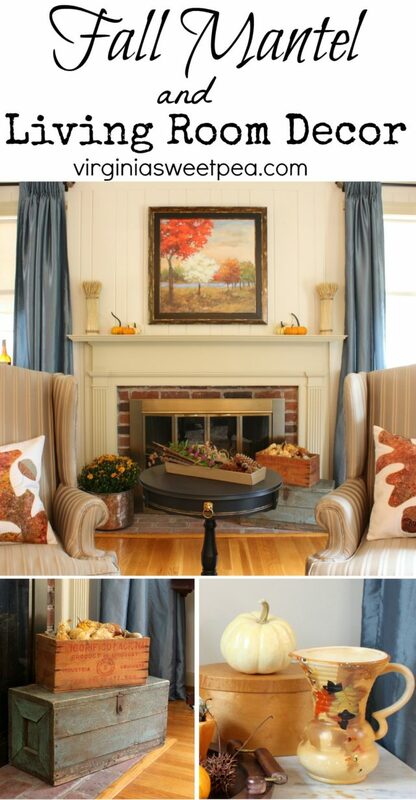 Fall decor is one of my favorites. I love your fall decor. 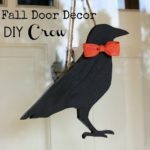 You inspire me to decorate for fall! Thanks for sharing all your ideas! Thank you, Peggy! I hope to see you at the lake very soon. I can’t believe fall will be here on Thursday! 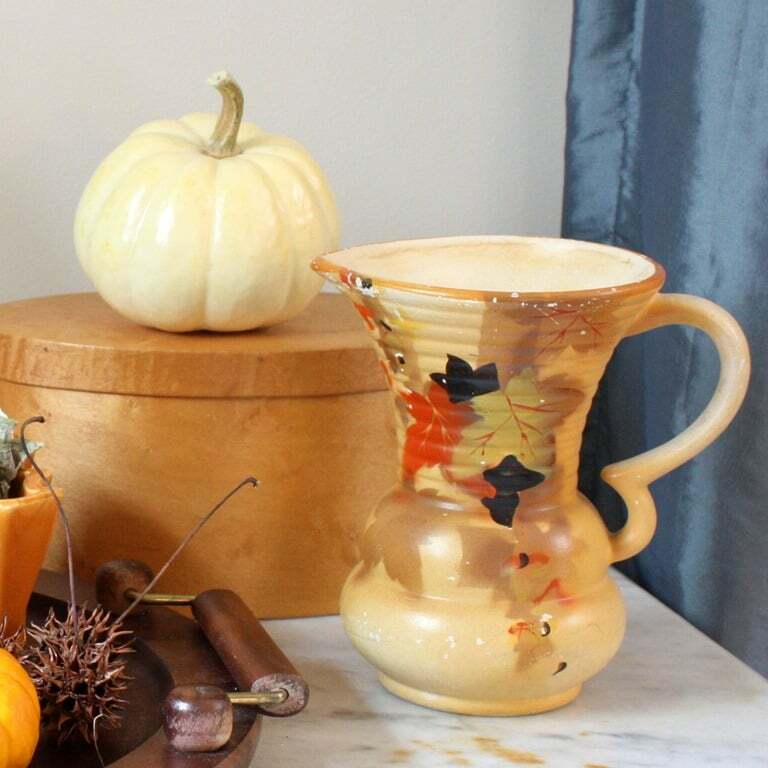 Wow, I love the Fall Scene you found at a yard sale. Perfect…and I’m jealous! I debated buying it but for $10, I had to have it! Your home is always so warm and personal. I love the found treasures and gifted items. Looks like a beautiful start for fall! Thanks, Kim! I know I’ll enjoy this decor through Thanksgiving. Thanks, Christy! I was so glad to get this space decorated. It makes me happy to come home to a spot that looks pretty. Sherman’s living room is beautiful! 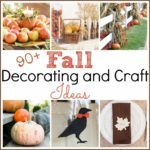 I love everything that you collect 🙂 Your fall decor is perfect! It all looks so warm and beautiful Paula!! And I adore that Copper Pot! I hope you are doing well! Thanks, Karen! I’ll bet that fall is different this year for you now that you’ve moved!! So beautiful! It is so cozy and classic. I am smitten over that chest!!! My grandmother bought that chest in WVA to replace a piano when my aunt took it home with her. I’ve always liked it and am glad that I inherited it. What an absolutely beautiful room. 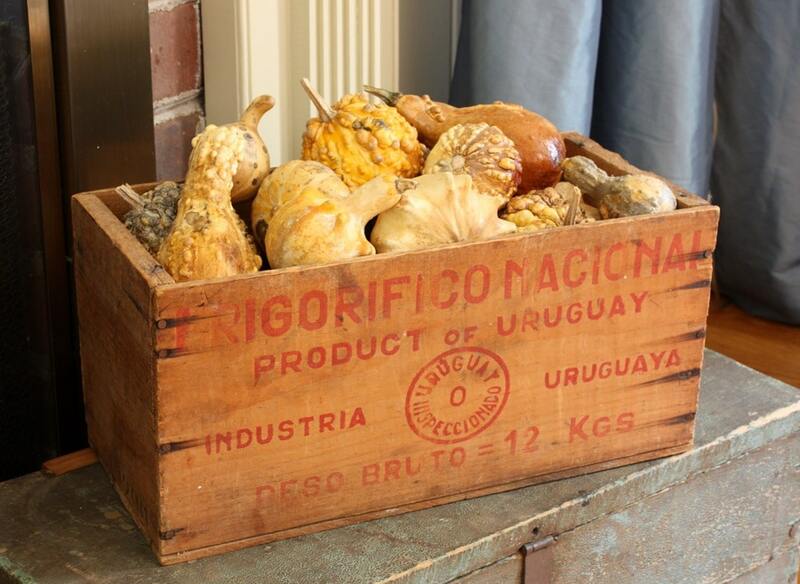 I especially love the vintage wood crate filled with gourds. So pretty. Thanks, Barb! I noticed on my personal FB page that one of my teacher friends shared your centerpiece from the tour. That made me happy! 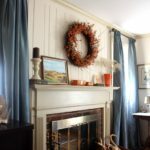 Your fall mantel and decor look lovely. The room is so warm and inviting. Pinned. Thanks for sharing at Snickerdoodle. Thanks, Janet! My grandmother treasured what she had and I’m lucky that I inherited a lot of her things. Thanks, Jamie! 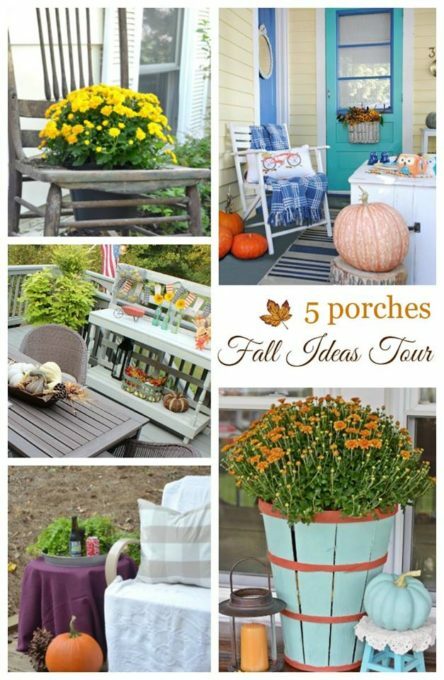 I also love fall decor. Well, Paula, I did get a tour of your living room, even if it’s not your entire house. You did a wonderful job. I love family history. 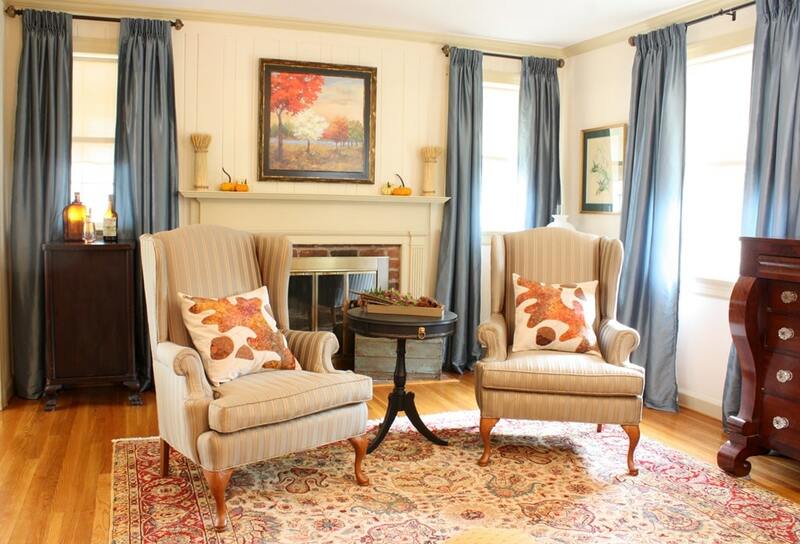 You have made the room welcoming, restful, and colorful; it is lovely!